KERIS in the Big Indonesian Dictionary means: sharp-gloved, sharp-pointed, double-edged weapons (the blades are straight, some are curved). Whereas in the history of the keris, it is not known exactly what the weapon was called Keris. A Prince of Surakarta Palace named Pangeran Hadiwidjojo, describing the meaning of the word KERIS, he mentioned that the word Keris comes from Old Javanese (Sanskrit) which means to draw. According to a professor of Islam in Yogyakarta, Ki Moesa Al-Mahfoed was of the opinion that the word keris was derived from the word Haris which means guardian of personal safety. The spelling of the kris also varies, in Western literature there are some spelling of kris, karis, crist, cries and krees. Whereas in Indonesia itself there are several words from the word Keris. In Java it is also called Curigo, wangkingan, dhuwung. In Sumatra call it curry, in Sulawesi it is called tappi, in Minahasa it is called kekesur, in Bali it is called kedutan. Keris must consist of two main parts, namely the keris blade (including the pesi) and the marijuana section. The blades and pesi symbolize the phallus, while the marijuana part symbolizes yoni. In the Javanese Philosophy, which is said to be the same as the Hindu philosophy, the union between lingga and yoni is a symbol of hope for fertility, permanence (strength), and strength. Keris blades must always make certain angles against marijuana, not perpendicular. The position of the slanted or forward-leaning keris bar is the nature of the Javanese, and other Indonesian ethnic groups, even someone of whatever rank and position, must always be submissive and respectful, not only to the Creator, but also to his fellow man. Rice science, the saying goes, the more knowledgeable a person is, the more submissive the person is. The size of the dagger length is usually between 33 cm and 38 cm. Some of the outer kris can reach 58 cm. Made in southern Philippines, the length can reach 64 cm. The shortest is the Kabudan keris and keris made by Nyi Sombro Pajajaran, which is only about 16-18 cm. Indeed, a very small and short keris, for example 12 cm, or even smaller than the Bolpoint size, cannot be classified as a keris, but rather a keris shaped Jimatan. A good keris must be made and forged from three kinds of metal, at least two, namely iron, steel and pamor material (meteorite or today using Nickel for pamor material). Thus, keris made of brass, zinc, and other metals cannot be classified as keris, but only as replicas of kris or keris-keris. Keris can be found in various regions of the archipelago, including regions that have entered the territory of the Majapahit Kingdom. 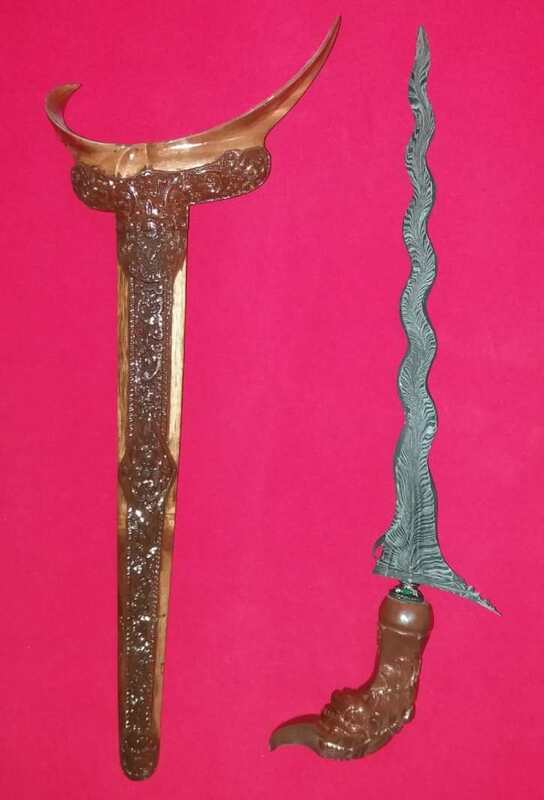 Therefore, we also find keris in Thailand, Philippines, Cambodia, Malaysia, Singapore and several other regions. Some cultural experts say that keris is a CULTURE OF ARCHIPELAGO. The oldest keris is made on the island of Java, estimated to be made in the 6th - 7th century AD. This keris is known as the BETHOK and JALAK BUDHO keris. In the World of Tosan Aji, Keris which is estimated to be made at this time is called the Tangguh Kabudhan. In accordance with its position as an early work of Keris Culture, its shape is still simple with a relatively short blade length. However, the metal material is classified as the material of choice and the method of manufacture is estimated to be different from the way of making keris today. Kabudan kris is generally not prestige, or if there is a pamornyapun classified as prestige. Pamor tiban is the prestige that appears in the keris without being designed by the Empu Maker. So, on average, the budho kris is tiled and some are Nyanak. Along with the times and the development of the Community Culture, the form of kerispun is developing. What was originally a kris only had a straight and short shape, then the shapes of curved kris appeared and were long up to 30 cm. The pattern of various components of keris / ricikan which was originally simple, namely gandik, pejetan, and sogokan, evolved into a variety of twists, such as: peanut flower, lambe gajah, jalen, jalu memet, beard, lis-lisan, odo-odo, janur, greneng, high, sategal fatties and so on. The process of cleaning metal material from the dirt (proses wasuhan). The process of forging iron, steel and pamor materials (proses penempaan). The process of forming the blade and its Ricikan. The process Menjamas and mewarangi the blade of the Keris. Then proceed with the process of making Warangka, deder and its accessories by Tukang Warangka or known as Mranggi. At present, the traditional way of making keris is still maintained. Some regions in Indonesia that have keris-making places include Yogyakarta, Surakarta, Madura, Luwu (Southeast Sulawesi), and in other areas. The process of making the keris today still uses the old rules, even though there are still some Empu and clever kris do rituals like the old masters. Ancient relics that can be used as sources and historical evidence of keris in the form of inscriptions, reliefs on several temples, and several artifacts from archaeological findings. In Java there are several inscriptions as historical evidence, namely the Karang Tengah Inscription and the Poh Inscription. In the inscription is written the word "Kres" which means keris. The inscription was made around the 9th century. An inscription found in the area of ​​Kedu, Central Java, was made sometime in 750 AD, which read that a King from the Syailendra Family had ordered a master to make a kris. In Singasari Temple, East Java, which was made in the 13th century there is a statue of Bhairawa whose hand holds a dagger resembling a keris. In Panataran Temple, East Java there are reliefs depicting the story of an ape soldier who will stab a giant with a keris. And on the wall of Sukuh Temple in Central Java, which was built in 1456 AD, there is an atmosphere relief Besalen where the keris is made. Keris is sometimes also associated with various petilasan, which is a place considered to be a certain character in a fairy tale or history. Near the city of Cepu, Central Java, there is a tributary of Bengawan Solo which is considered a former battleground between Arya Panangsang against Sutawijaya. Some keris lovers assume that Arya Panangsang's Kober Demon Keris can be found there. In the 11th century Prabu Airlangga era, Empu Kanwa composed a Kekawin Arjuna Wiwaha which tells the story of Arjuna killing the giant king Niwatakawaca using Pasopati heirlooms. In the story, Pasopati is a crescent-shaped arrow, while in the ceramics world, pasopati is used as the name of a keris. In the 14th century, a traveler from China named Ma HUan came to Majapahit. On his return to mainland China he wrote about his journey and told him that in Majapahit almost all adult boys had squiggly-stabbed weapons on their waists. The weapon is called Keris. In addition to the Arawuna Arjuna Wiwaha, there are also notes from Kekawin Sumanasantaka, Sutasoma, Kidung Ranggalawe, Babad Tanah Jawi, History of Empu (Pangeran Wijil III of Kadilangu), and Serat Centini (Paku Buwono the V). In the Babad Tanah Jawi, most tell the ups and downs of the kingdoms in Java from the Galuh Period to the Mataram Age. 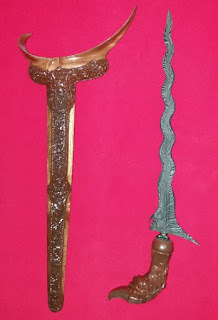 Various keris names such as Kyai Naga Sasra, Kyai Sabuk Inten, Kyai Condong Campur, Kyai Sangkelat, Kyai Setan Kober, Tombak Kyai Pleret, Kyai Baru, Kyai Buyut and Kyai Gumarang, are said to play a role in the history of the kingdoms in Java. The history of the Empu is written in the form of a song, its contents tell the story of the masters and some of the results of his work keris. Serat Centini Also written in tembang form, the contents cover various aspects of culture and include the Tosan Aji. Whereas the Pratelan Dhapur Dhuwung saha Waos book was written in the form of broadcasts, describing the story of the beginning of making Tosan Aji and various types and characteristics of kris and spears. The figures who contributed to the writing of books were: Ronggowarsito, Zainalfah (1954), Walujodipuro (1958), Hadiwidjojo (1961), Darmosoegito (1961), Moebirman (1970), Hamzuri (1973,1984), Syamsul 'alam (1982) Soemodiningrat (1983), Prince Wijil III (transcription of Soemarijah Pranowo 1985), Paku Buwono V (1985, 1986), Wirasukadga (1985), Bambang Hansrinuksmo (1985,1987,1990,1991,2003), Haryono Haryoguritno (2007) and so on, there are still many authors of pavement books. Keris is made not merely as a tool to fight and kill enemies, but rather as a weapon in a symbolic sense and in a spiritual sense. For the people of Java, the keris used to be a 'sipat kandel' because it was believed to have many magical powers or luck. For those who believe, certain kris can increase one's courage and confidence. There is also a keris that is believed to be able to ward off disease outbreaks and plant pests, disturbance of spirits, and make it easier for their owners to find fortune and elevate their position. Even the keris is a symbol of degree in the community first. Indeed there are several kris which have been used in history to kill, such as: Keris Empu Gandring, Keris Setan Kober, Keris Pasopati, etc. For example, in the 18th century the keris of Kanjeng Kyai Balabar Keris owned by Pangeran Puger berdapur Pasopati was used by Sultan Amangkurat Amral to sentence Trunojoyo to death in Kartasura square. Keris is made as a heirloom, ageman, and as a cultural art object. In its development, Keris became one of the components in Traditional Palace and Clothing that showed the degree and position in society. So it looks like the difference between the kris which is diagem by nobles and keris used by ordinary people. The cousin is decorated with luxurious accessories. For the nobility who certainly had a lot of possessions, of course Keris was used with luxuries too. Not a few are wearing gold, silver and wearing wooden pieces that are expensive. From the shape of the keris blade, the nobility usually ordered kris to the famous empu or palace in his day. So in terms of working, the famous Empu Keraton and Empu in their time were more beautiful, wangun and neat than working on ordinary masters. The rewards for the services of the soldiers were in the form of a spear or keris which was crushed by gold with the image of Sada Sakler, Sapit Landak and Trident. The rewards for the services of the Warrior and Panewu Mantri Officers were heirlooms in gold. The picture was the head of the Elephant and Lion. Reward for the Leader and Wadana in the form of gold legacy in the form of lunglungan and ron-ronan. The reward for the Keraton Keraton and Patih Dalem is the heirloom that is hardened by Gold with the Orchid Flower. This is evidence and is recorded in the history of the Perkerisan that Kanjeng Sultan Agung is truly a figure who pioneered the development of TOSAN AJI ARTS. During the buying period, you will start a lot of heirlooms in the form of keris or spear which are either golden or broken. This makes Gold Heritage Heritage fast growing. 0 Response to "INDONESIAN KERIS HISTORY"